Starbucks Coffee Company announced a partnership with Square to provide mobile payments in some 7,000 coffee houses nationwide. Starting this fall, customers will be able to use Pay with Square, Square’s mobile payment app for iPhone and Android, at participating U.S. Starbucks stores, as well as find nearby Starbucks locations within the Square Directory. Pay with Square does not use NFC, relying instead on GPS technology to alert merchants at the point of sale when registered customers enter a shop. A profile of the customer linked to a credit card automatically appears on the merchant’s screen, and transactions are completed by simply confirming the customer’s identity. 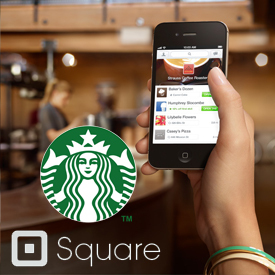 As per the agreement, Square will process all Starbucks U.S. credit and debit card transactions, while Starbucks will invest $25 million in Square as part of the company’s Series D financing round. Starbucks chairman, president and CEO Howard Schultz will also join Square’s Board of Directors.